The Fredericksburg Chamber of Commerce invites everyone to help celebrate the town’s German heritage and Texas hospitality during Night In Old Fredericksburg, coming June 10 & 11, 2011, to Marktplatz in downtown Fredericksburg, Texas. This year will mark the festival’s 48th Anniversary and its moving to June! Night In Old Fredericksburg is actually two nights and two days, showcasing the history, culture, food, and fun of this charming Hill Country community. Organizers have put together a weekend event guaranteed to stimulate all the senses and to delight folks of all ages. 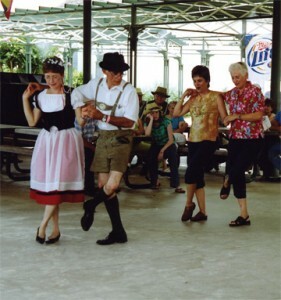 Revelers can listen and dance to nine different bands playing polka, show tunes, and country from the comfort of two covered stages. Acts include the world-famous Sauerkrauts, plus the popular Seven Dutchmen, San Antonio Combo, The Tuba Meisters, Walburg Boys, the Jodie Mikula Orchestra, and Cactus Country, as well as Almost Patsy Cline. Plus, we are spicing it up with the Cajun/Zydeco sounds of Ponty Bone and the Squeezetones. Night In Old Fredericksburg serves up a multicultural menu of tasty food and refreshing drinks. German favorites include sauerkraut and wurst served sizzling from the grill. Fans of Mexican food can sink their teeth into fajitas and tacos, and hungry visitors will find enthusiastic cooks serving up delicious burgers, fries, turkey legs, and other festival favorites. Fredericksburg knows its beer, so once again volunteers will be pouring more than 15 domestic and imported beers, straight from frosty taps as well as local wines. Night in Old Fredericksburg offers fun for every member of the family. Kids are sure to flock to their own special area where they can test their skills on a bungee jump, ride a Ferris Wheel, jump on a Slide and have fun, or test their skill at a variety of challenging games. Presenters on the grounds are proud to make history come alive, with exhibits of pioneer crafts and activities. Top arts and craft vendors will set up tents along the walkways, showing off their collectibles, gifts, and one-of-a-kind creations. “The Fun Never Sets” at Night in Old Fredericksburg, which runs Friday from 6 p.m. to midnight, and on Saturday from 11:30 a.m. until midnight. Admission is $6 each day, or $10 for a two-day pass. Children age 12 and under get in for $1. Parking is free all around the venue. The event takes place on Marktplatz, the market square conveniently located in the heart of Fredericksburg’s historic and commercial district. That makes it especially easy for visitors to enjoy shopping, dining, and staying in this popular getaway. Night in Old Fredericksburg is sponsored by the Fredericksburg Chamber of Commerce, and has been celebrated since 1962. More information on this and other hill country festivals and events is available toll-free at 1-866-TEX-FEST (839-3378), or by visiting www.tex-fest.com.